The nine nominees for the Grand Prix des Associations Littéraires 2018 were announced on March 27, 2019. 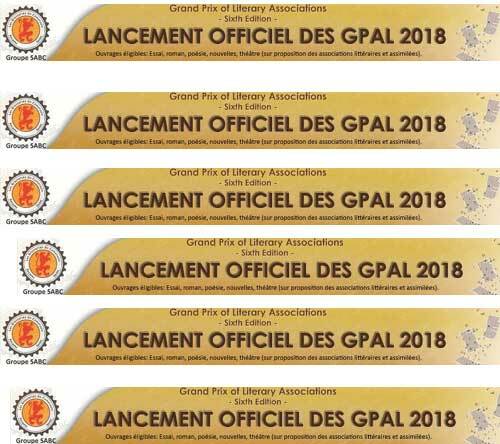 The Grand Prix des Associations Littéraires (Grand Prix of Literary Associations) were launched in Cameroon in 2013. The awards were then defined as bilingual English-and-French literary prizes awarded on the proposals of literary associations, especially in the Research and Belles-Lettres (beautiful letters according to Google translate) categories. Since 2015, the prize has been open to work written in other languages with a focus on African languages. They are run in partnership with Brasseries du Cameroun with sponsorship by Castel Beer. Previous winners of this prize have been Magloire Ondoa for Textes et Documents du Cameroun (1815–2012) and Eric Mendi for Opération Obama in 2013 ; Hermine Kembo for Le système africain de protection des droits de l’homme and Charles Salé for La’afal. Ils ont dit in 2014; Jacques Fame Ndongo, for Essai sur la sémiotique d’une civilisation en mutation and Fiston Mwanza Mujila for Tram 83 in 2015; Felwine Sarr for Afrotopia and Eric Mendi for AFANE – Forêt Equatoriale in 2016; Ebénézer Billé and Georges Moukouti, for Hispanoamérica: visión contemporánea and Macaire Etty, for La geste de Bréké in 2017. Apart from the prizes in these two categories the organisers also hand out a few other awards on the day of the ceremony. They include a posthumous honour they call the Grand prix de la mémoire which has been won by Francis Bebey (2013), Tchicaya U Tam’Si (2014), Cheikh Anta Diop (2015), Sankie Maimo (2016), and William Edward Burghardt Du Bois, also known as W.E.B. Du BOIS (2017). Also on offer is the Grand Prix des Mécènes that has been awarded to Guillaume Oyônô Mbia (2014), Patrice Kayo (2015), Bernard Dadié (2016), and Seydou Badian Kouyaté (2017). In the list announced there are nine authors of various nationalities seek the ultimate coronation with three in the Research category and six in the Belles-Lettres category. The jury is chaired by the Cameroonian writer Patrice Kayo (Grand Prix des Patrons 2015). Nelson Rolihlahla Mandela: Mbandu ya luzingu by Protais Yumbi (RDC), nominated by l’Association les Amis du Livre (Congo Brazzaville). Yemen in Crisis by Helen Lackner (UK), nominated by Middle East Studies Association (US). Africa in transition: A New Way of Looking at Progress in the Region, by Ejeviome Eloho Otobo (Nigéria), nominated by Iqra Books Nigeria. Los versos lunares, by Edmundo Vélez Alcívar (Equateur) nominated by Colectivo Cultural Initiava Poética (Veracruz – Mexique). « Je verbe » by Kouam Tawa (Cameroun), nominated by La Compagnie Feugham (Asso-prize 2014). Ms Ice Sandwich, de Mieko Kawakami (Japon), nominated by Japanese Language House (Boston University). KHALIL by Yasmina Khadra, nominated by l’Association culturelle la Grande Maison de Tlemcen (Algérie). Dance of the Jakaranda by Peter Kimani (Kenya) nominated by the Kenya Oral Literature Association. Quand la montagne explosera by Eddy Broussillon (France – Guadeloupe), nominated by l’Institut Monnerville. The winners will be unveiled on April 23 at the GPAL 2018 awards ceremony at the French Institute of Cameroon in Yaoundé. Pingback: Ngugi Wa Thiong’o to be awarded Grand Prix des Mécènes 2018. Previous Previous post: Geko Mofolo Prize for Outstanding Fiction in Sesotho 2019 judges announced. Next Next post: Gerald Kraak Prize 2019 shortlists announced.